Craving for a home-cooked pork binagoongan and a plateful of pancit malabon? How about a classic afternoon merienda of lugaw and lumpia? If you happen to pass by Quezon City, I have just the place for you. Neatly tucked in a quiet street in QC is an eatery called Lola Idang’s Bahay Pancitan. The place is not that big, with only about ten tables set on a 35-square meter eating space. The restaurant is so unassuming that you’ll hardly take a second look at it; plain white tiles flooring, simple decors, plastic Orocan chairs and tables laid with generic plaid table clothes. What distinguishes this small diner from the throngs of eating-places in Quezon City though is their food. I have never tasted a binagoongan as good as the ones being served at Lola Idang’s. Crispy binagoonan (Php105.00) as they name it is divided into three layers. The bottom one, a peeled steamed eggplant, over it is the pork which is fried to a crisp (almost bagnet-like in its crispiness), and topping those two off is a generous serving of lightly sweet & chili bagoong (shrimp paste) and some tomato and onion garnish. Paired with a steaming white rice and a spicy vinegar dip and you’re in for a superb treat. Just writing about it actually makes my mouth water. Although the resto can actually live off with just their binagoongan dish, they do actually serve other chows too. As their name connotes, their actual specialty is Pancit Malabon. These can be either ordered ala carte or can be bought in bilaos (large woven tray) of varying sizes for take-outs. I have tasted their pancit once and unfortunately was not that impressed though. Aside from their crispy binagoongan, another of my favorite is their lugaw (rice porridge) (Php30.00), tokwa (fried tofu) (Php35.00) and fried lumpiang ubod (spring rolls) (Php38.00) combo. Their lugaw is flavored just right, its consistency and texture spot on. Paired with the overflowing bowl of tokwa dipped in spicy soy-vinegar and their crispy lumpia and we’ve got a classic afternoon merienda elevated to a higher level. Unfortunately, you can only enjoy these dishes if you can stand their inattentive, unsmiling and unfriendly serving staff who’d rather crowd into their booth than take your order. I’ve actually on several times felt that it was too much trouble for them to have your orders taken and even had to approach their station to call their attention. Ask for a glass of water; expect it to arrive a century later. Take too much time choosing an order, and you’d almost feel them looming up your back, eyes rolling upwards, mouth bent downwards. Despite all that, I still frequent this simple eating place. In the end, it’s still the food that matters anyways. Lola Idang’s Bahay Pancitan however would certainly feel homier and live up to its name if only their people would make you feel you’re welcome to dine in their restaurant. I just hope that next time I enter their premises; their service can actually compliment the excellent dishes they serve. After being away for so long, I was finally able to go back to Lola Idang’s to have a taste of crispy binagoongan (Php105.00). 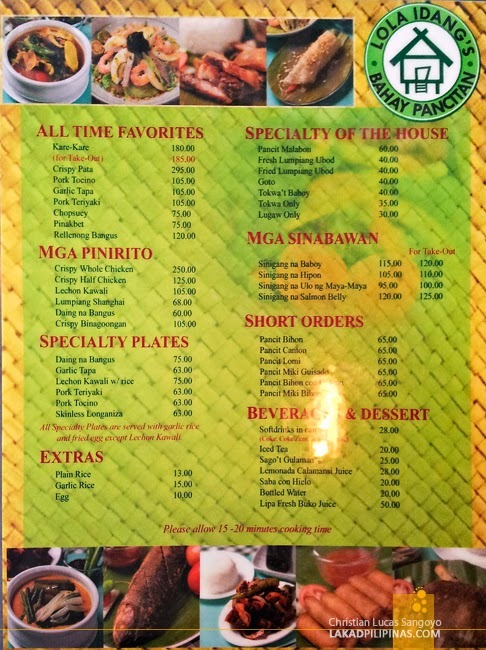 We ordered a plate of it along with rellenong bangus (Php120.00), a bowl of pritong tokwa (Php35.00), a serving or lumpiang ubod (Php40.00) and two glasses of sago’t gulaman (Php25.00). It was as if I’ve never left. The binagoongan is still as excellent as I remembered it to be. The bangus is new to me but I didn’t like it that much. The tokwa though is still good but still don’t like the fresh lumpia. Pricewise, everything is also amazingly the same! The only thing that probably changed is the waitresses serving us. Gone were Lola Idang’s sour unsmiling gals from before, replaced by a more attentive staff. Well, they’re still not into smiling, but at least they’re quite helpful and don’t make you feel unwelcome. A good change! I got to visit Lola Idang’s again a few weeks ago and besides ordering the usual favorite, the Crispy Binagoongan, I was able to try out a few of their dishes that I haven’t had the chance to order before. First off, Lola Idang’s Garlic Tapa (Php105.00). This is an ala-carte order so rice is not included. Serving size is generous, more than good enough for two persons at least. The taste is excellent, really really savory. Unfortunately, the meat was quite rubbery, which was a big letdown. Next up was their Pancit Lomi (Php65.00). I usually don’t dig lomis, besides the one I tried in Casa Rap. I get easily turned off by its icky gooey soup, but surprisingly, I actually liked Lola Idang’s version of it. The taste is just right and the soup consistency is perfect (meaning, not icky haha). For its price, serving size is on the biggie side. The usual Crispy Binagoongan and Fried Tokwa still didn’t disappoint. We came out happy and super full. It was certainly another good lunch at Lola Idang’s. i agree with you though, everything would've been perfect if not for the unfriendly staff. ayaw ata magtinda e.
it's all about the food anyways. guys check out the fried lumpiang ubod, lugaw and everyone's fave: crispy binagoongan. Gotta agree with your review of this place. I've been here & back more than a couple of times, given the proximity. Crispy Binagoongan still tops my list, with Liempo coming a close second. And this particular branch on Examiner St. cooks it differently. Their Visayas Ave, branch cooks this dish differently. Less crunch, smaller portions. For drinks, I regularly order the either the Calamnsi juice or Sago't Gulaman. If you want that Calamansi Juice at home, you can buy one bottle of concentrate from Lola Idang's, or walk on over to Parco for a P10 saving. Hula ko si Jolengs ka haha! May lomi ba sa Idang's pre?. Nyaha ang lapit lang pala natin! SA Parco ka mismo work? Di nga? Kare-kareng ipis? Grabe yun ah! To be fair, their place looks clean enough, though I of course haven't seen their kitchen. Christian: No, our office is in the building owned by Universal Records. Yung KK ipis,once lang naman yun. Although I haven't gone back there since I heard about it. Ah, you're from the cd sale tower! That place really makes a dent on my savings everytime the hold a sale ehehe. we love their pancit malabon! I love eating at Lola Idang located at Examiner and Katipunan branches. More than 4 years already. Lately, at Examiner's branch - I am embarrassed with the male waiter - a fat guy. The way he talked with the customers is disgusting. He is not accommodating and not organized. Really pisst off. To the management of this branch - please orient this person because he is destroying your reputation. The food is good but this guy's service is really bad. NAKAKA-INIS! .... Thank you. Hi Amy, Lola Idang's Examiner branch really has a bad reputation for its services. Never did I feel welcome whenever we eat there. But the food is really good, especially the crispy binagoongan, so we just let it be.